For the majority of the 2015 NFL Draft process, the consensus was that quarterback Jameis Winston would be selected by the Tampa Bay Buccaneers with the first overall pick. However, since we’re getting closer and closer to April 30, the speculation will persist until that first name is taken off the board. 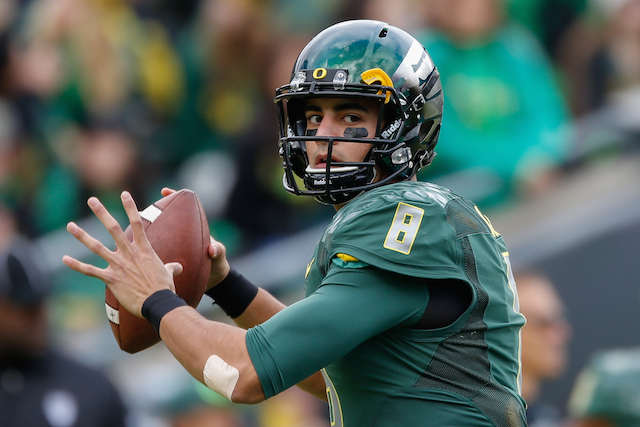 And according to ESPN analyst Ron Jaworski, that person might actually be Oregon product Marcus Mariota. While speaking with CSN’s Philly Talk, via phillymag.com, Jaworski said, “The latest I’m hearing now from my sources around the league, who are pretty wired in, is that he’s going to go number one now to the Tampa Bay Buccaneers. Of course, no one truly knows if this is exactly how it’s going to play out. But it has become apparent that folks are starting to love Mariota a little more than they used to. In fact, his name has been climbing in recent mock drafts. So anything is possible. And it’s not as if he doesn’t compare to a few previous quarterbacks selected first overall in the draft. With that in mind, here are three past top selections that are similar to the Oregon product. Eli Manning was selected first overall by the San Diego Chargers in the 2004 NFL Draft. As everyone knows, he never took one snap under center for the AFC West team. Manning got his wish on draft day and was traded within the hour to the New York Giants. If you’re comparing the younger Manning to Mariota, the first noticeable similarity would have to be their build. 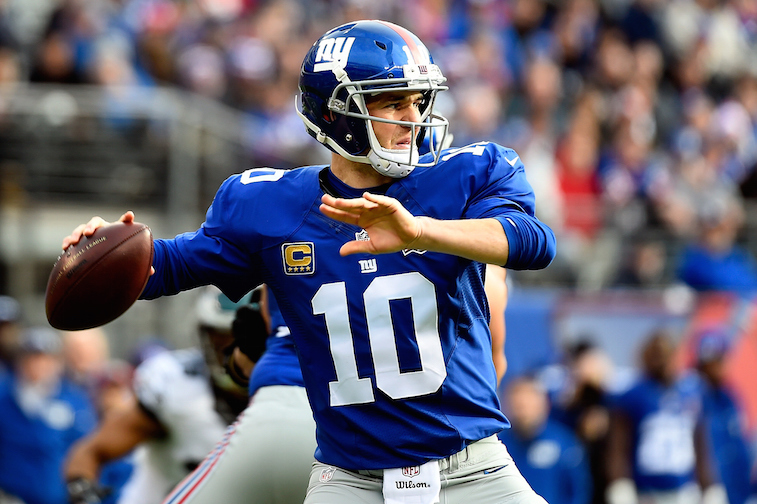 The Giants quarterback is 6-foot-4 and 218 pounds, which is the same height as Mariota, albeit one pound lighter. Though these two QBs are not very similar from an athletic standpoint, they both carry themselves the same way on the football field. While they are both leaders, they each let their play do the talking. Neither is an overbearingly verbal presence, but each commands respect from his teammates. Manning and Mariota each have short memories on the gridiron. As a result, they are both able to move on from negative plays. This is a crucial trait that one must have if he hopes to be successful in the NFL. If Mariota is lucky, like Eli, he will find himself hoisting multiple Lombardi trophies. Before being selected first overall in the 2005 draft, Alex Smith thrived at Utah because he was an accurate passer and didn’t make many mistakes. As a junior, in his final season for the Utes, Smith had a 67.5% completion percentage, throwing for 2,952 yards and 32 touchdowns. On top of that, he only had 4 interceptions and finished with a passing efficiency rating of 176.5. Smith thrived under Urban Meyer’s spread offense and proved that he could also make plays with his feet, finishing the year with 631 yards rushing and 10 touchdowns. Mariota fits the bill in all these categories. In his final season at Oregon, the Heisman Trophy winner had a 68.3% completion percentage to go along with 4,454 yards in the air and 42 touchdowns. His passing efficiency rating was 181.7 and he only had 4 picks on the year. Mariota did it on the ground as well, ending the year with 770 rushing yards and 15 rushing touchdowns. If you were to place these two quarterbacks next to each other, the only difference would be that Mariota has about seven pounds on the current Kansas City Chief. One thing you can say is that Smith needed a few years to adjust to the demands of the league. If given a similar learning curve, Mariota has the potential to be a quality starter in the NFL. The St. Louis Rams selected Sam Bradford with the first overall pick in the 2010 NFL Draft because the former Oklahoma Sooner could sling the football. Plain and simple. In his 2008 Heisman Trophy season, Bradford threw for 4,720 yards and completed 67.9% of his passes. He had 50 passing touchdowns, 8 interceptions, and a passing efficiency rating of 180.8. These numbers are extremely similar to the ones Mariota put up in his final season at Oregon. The two QBs have the the same 6-foot-4 height, but Bradford weighs more, has a bigger arm, and is definitely not as light on his feet. Still, you know similarities exist when Eagles coach Chip Kelly sees the value in both quarterbacks. Bradford may have spent most of his pro career battling injuries, but like Mariota, the potential is clearly there. Both of these guys make quick decisions and are accurate with the ball — two attributes that are super important for any NFL quarterback t0 have. There is no telling if Bradford will rebound in Philadelphia or if Mariota will be able to adjust to the pro game. In the end, it’s going to come down to capitalizing on potential, which is something that both of these young men have in spades. All statistics are courtesy of Sports-Reference.com.